Having been in the event production business for 20 years and counting, we’ve yet to meet a challenge we don’t feel inspired to rise to. So, when Klaxoon, the global champions of productivity tools for teamwork, arrived in Austin for SXSW and contacted us with just ten days to plan their event, we couldn’t resist showing off a little. 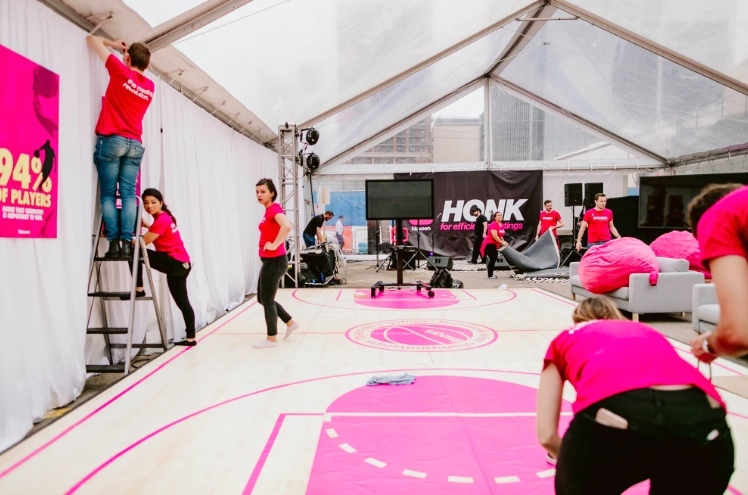 Having traveled through 16 cities in 11 weeks with a 60-foot long pink truck to spread the word of the meeting revolution, the client wanted to allow guests at their activation to follow in the footsteps of top NBA players and discover the power of teamwork along the way. We helped them put together a unique, immersive pathway, mixing digital experiences with live sports games to challenge them — and, of course, help them win gifts. Mixing business with pleasure, Klaxoon hosted great keynote leaders who shared their experiences and insights with regard to the latest productivity trends. Predicting the future of work is no small feat, and these all-stars shared awesome tips inspired by the greatest teams around the globe, inspiring those in attendance to think in new ways about adapting to a drastically changing global workplace. We made sure the stage was literally set to perfection so the only thing the speakers had to worry about was how to voice their brilliant ideas. We can’t give away any trade secrets, but we can tell you we were able to help this client make their vision real in just over one week, readying them to take their place on a grand global stage with confidence. Take a behind-the-scenes peek into some visuals from the lead-up to the big event. Want us in your corner when your next big brand activation or event rolls around? Get in touch and let’s talk possibilities. Mar 25 Pop the Champagne: Kennedy Brings Home Two ILEA Awards!